Hello there! Labor Day is on the horizon - can you believe it? Labor Day weekend for me will be all about laboring around some house updates. First up on the list: make over the kids' blue bathroom. 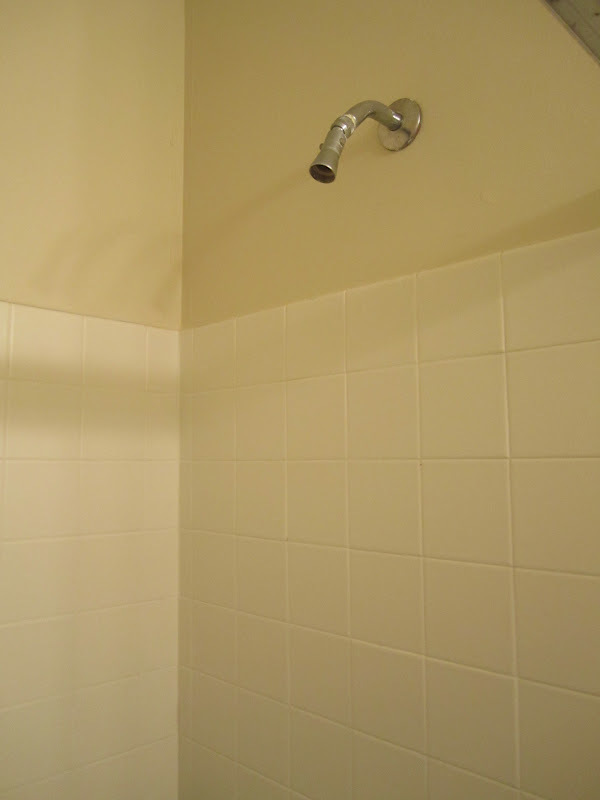 Right now the walls are a drab tan, which matches the drab tan tile. 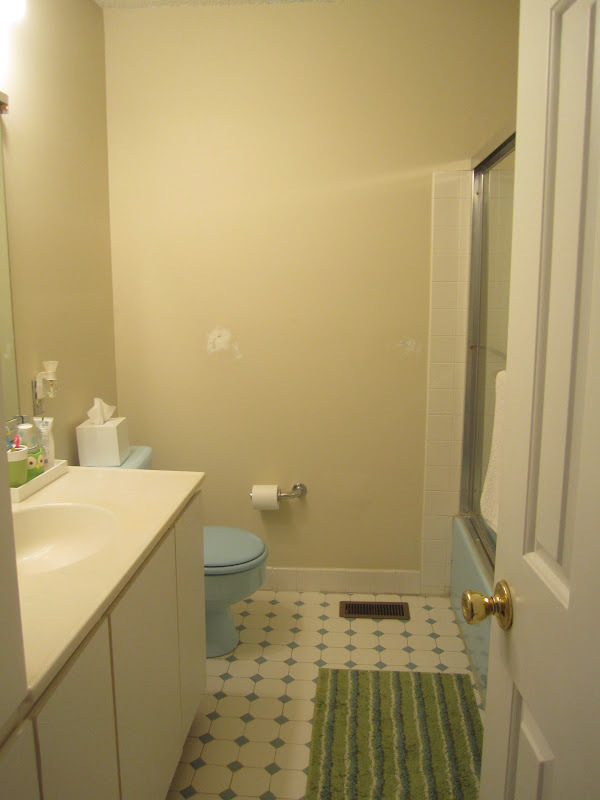 The color of the wall and tile make the space feel sad, dark and a little dingy. I bought warm white paint (Sherwin Williams Alabaster) for the walls. I think the white will make the room look bigger, brighter and cleaner. Here is the room as it looks now. And here's the plan. 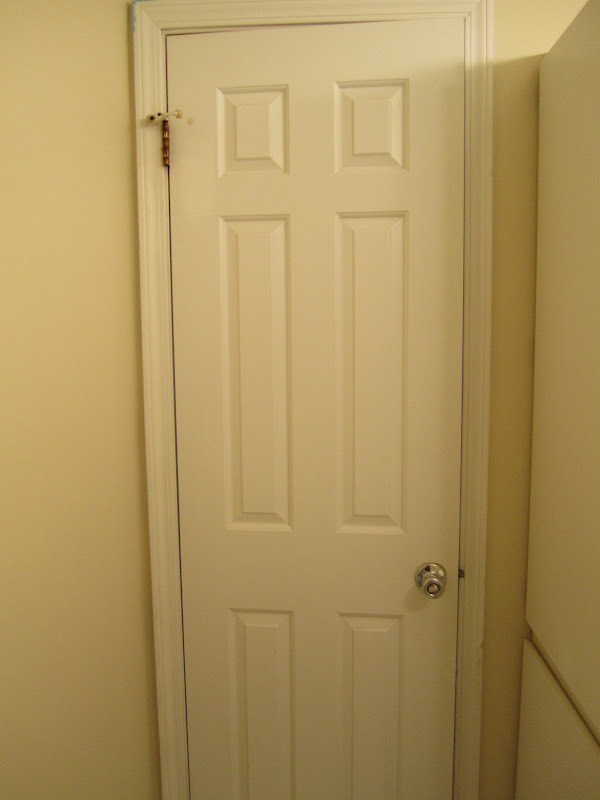 First, I need to touch up the white trim all around the room. I can tell that someone had painted the room bright neon blue before, because I can see it in spots on the trim and tile. See? 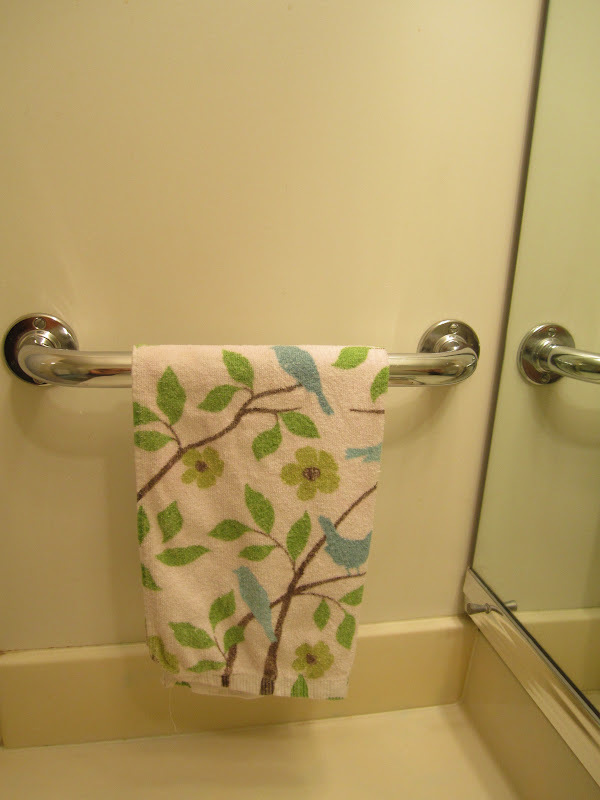 I am going to remove the plumbing supply looking towel bar and toilet paper holder. I think they just hopelessly date the space, so I'll invest $25 of my own money and pick up something new at Target. The shower needs a new shower head. Easy enough to replace. I also need a shower organizer to hang from that. 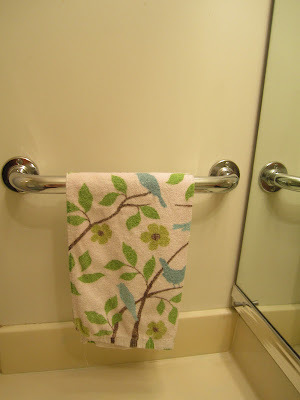 I also want to put a row of hooks on the back of the door for the kids' and guests' towels. 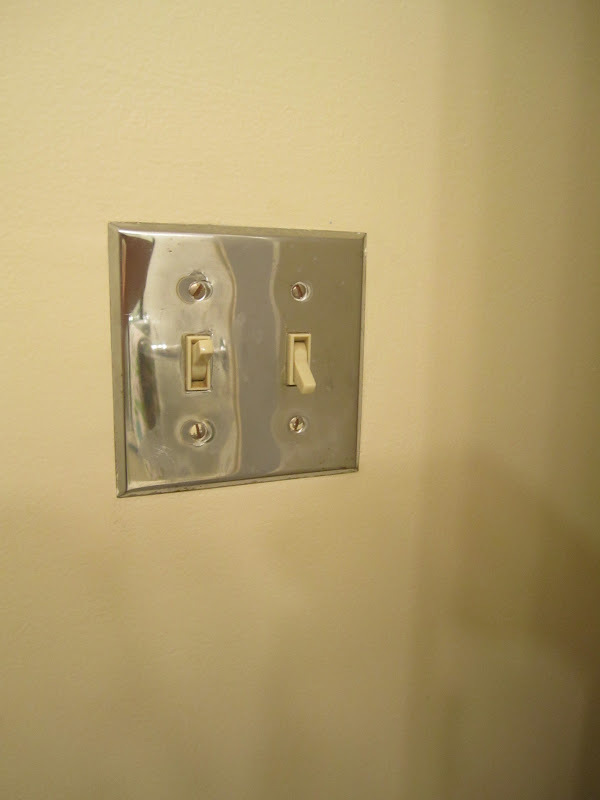 The rusty silver switchplate and outlet covers are out of here too. I'll replace them with basic white. Finally, the room needs some art! I am going to use my $.70 print from Marshalls (which used to live in my first home's laundry room) and pick up something else for the large wall. 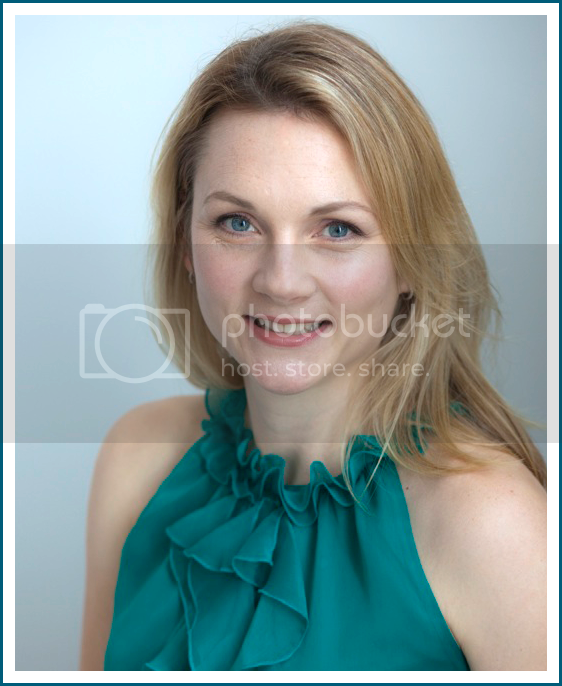 As for accessories, I am going to embrace the blue (as I have no choice!) and use a lot of white, green and blue in the space. I may add some hardware to the cabinets. I have a ton of pulls that I bought in bulk a few years ago. I'll see. Oh, and I found the blue and green bath rug shown above at Target and all of the green accessories at Target, too. The white tray and tissue holder are from Home Goods. 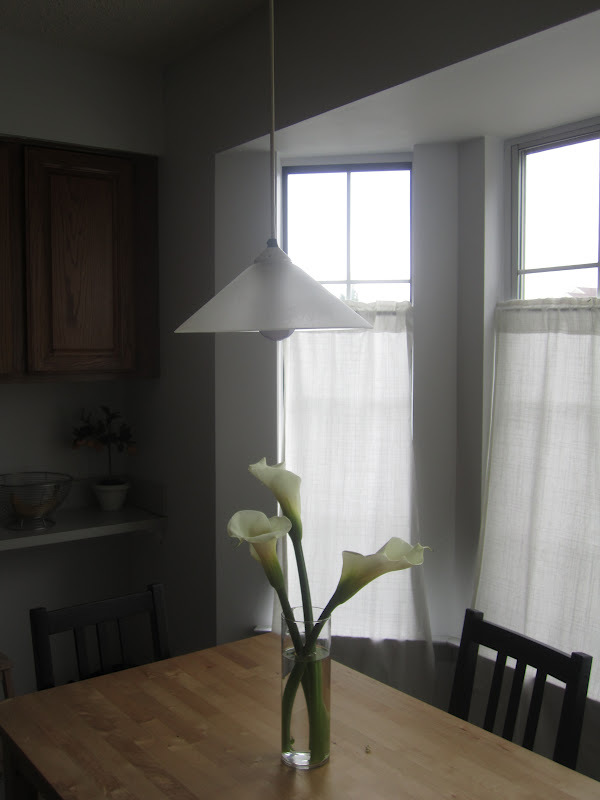 Artwork and window treatments. I am always amazed at how dramatically a room changes once those two things go up. They finish off a room so nicely and make it feel homey and happy. Up today is my master bedroom and my new curtains. The window in my bedroom is huge - about 72 inches wide. 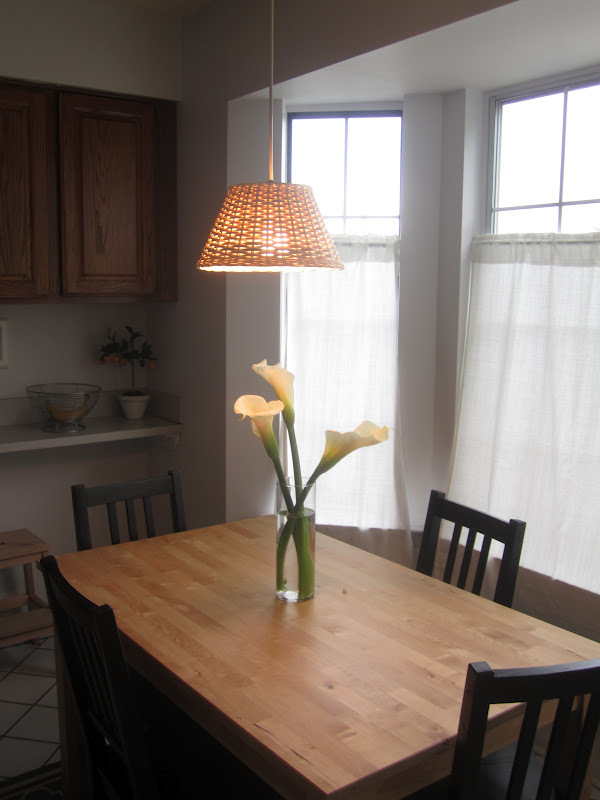 When I moved in, there was a cheap lightweight "honeycomb" blind covering the window. It was awful - dusty, broken and an eyesore. I knew I would replace it. 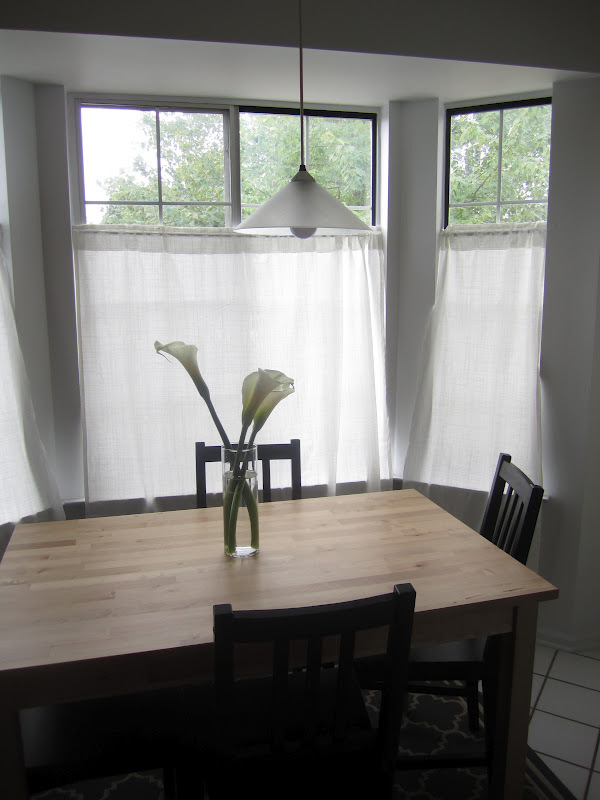 And replace it I did, with some thick slat plantation blinds that I purchased at Amazon from Top Blinds. The size, as you can imagine, is not standard so they were a little pricey, but worth it to me, since this is my bedroom and I want privacy and something that looks nice. 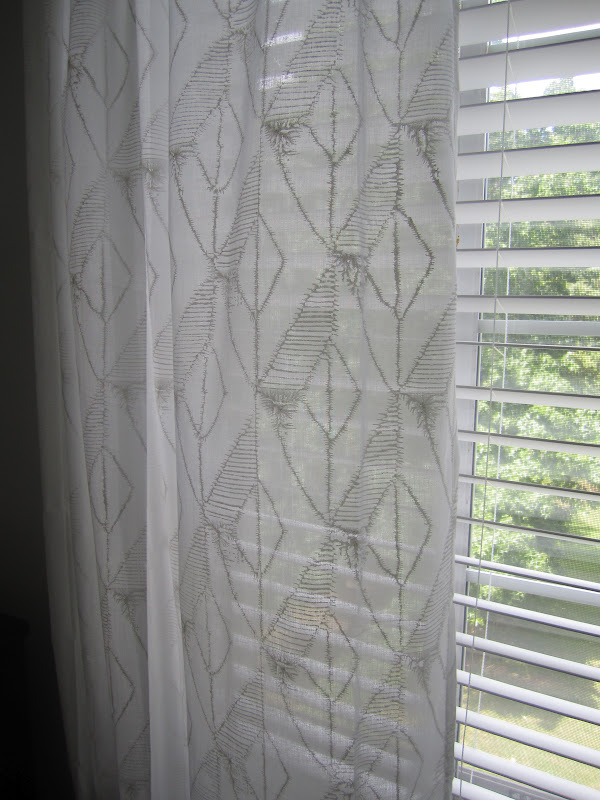 Here is the bedroom window with the pretty new blinds. I am sure it will come as a surprise to no one that I wanted a very soft, white-on-white curtain for that window. 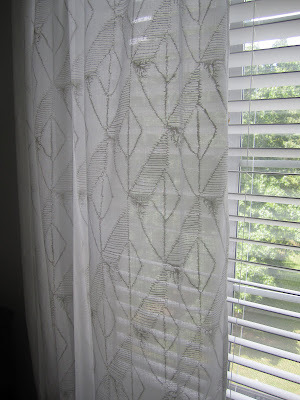 I went with the Diamond Block Panel curtain from West Elm, which were on sale when I bought them. I love how pretty and sheer, but not completely see-through they are. I found the extra long curtain rod at Target for about $30. All in all, not a bad deal for a pretty great upgrade. See? I have a little more work to do in my bedroom: hang art on the walls, accessorize, paint or silver leaf my jewelry box, etc. Fun fun! 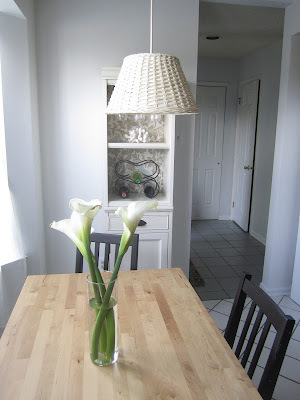 I have a tiny little upgrade to share with you today: my kitchen light fixture. Here it is before (sorry for the quality of some of the pictures). I really did not like this light fixture: it's too dated and just not attractive. But I also did not want to replace the entire thing because I'm only renting the place. So I looked under the shade and realized a simple swap of the shade would be a quick easy fix. Yay. Love that. 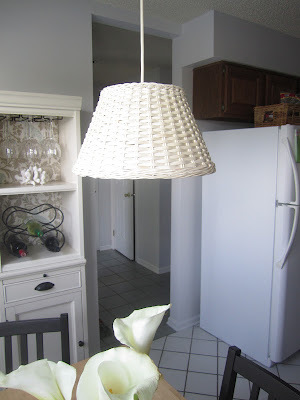 I headed to IKEA and found the Rogsta wicker shade for just about $10 (I can't find it on their website - bummer). I loved the texture of the shade as well as the color: it's a bleached natural color - not quite white but not quite natural. Very beachy, which you know I love. I think it will look great in the kitchen once I get around to painting the chairs white and adding upholstery to the seats. Even now, without those upgrades, it makes a huge difference in the kitchen. See? What do you think? Have you guys done any recent minor tweaks that make a major impact? Please share! Happy Monday! I am in a bit of disbelief that it is mid-August and we are staring down the barrel of Labor Day Weekend. Sure, it's a few weeks away, but around here, I am already hearing the cicadas chirping, which means Summer's coming to and end and school is almost back in session. 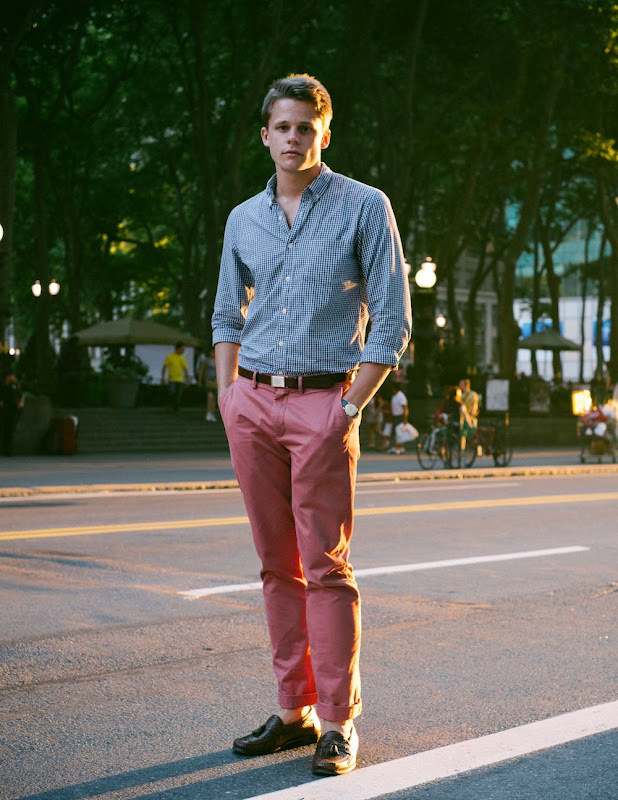 Before Summer goes, I want to give a little shout-out to a new Summer staple that I'm swooning over: Nantucket Reds. Ever hear of them? They are faded red (but not pink) shorts, pants, skirts and shorts supposedly made famous on the island of Nantucket. I just like the color - I like it so much that I ordered a skirt from a little shop in Nantucket, which hopefully is en route as we speak. 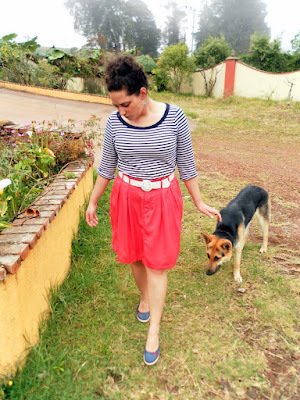 I've noticed a few people wearing them this Summer, and just recently I saw a woman walking to the bus, and she was wearing a Nantucket Red skirt, light chambray top, brown leather belt and wedges. I am stealing that outfit and will post here when I do! In the meantime, here is a round up of some of my favorite looks with Nantucket Reds, which are super preppy. I love this first look. 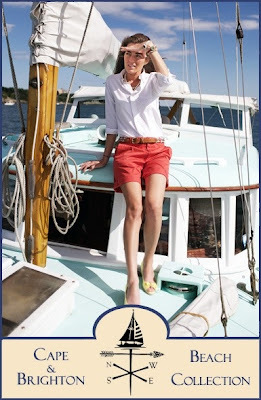 It's unapologetically nautical and I cannot stand how cute those Sperry wedges are. I love the color combo. This pink shirt with the Nantucket Red shorts is adorable. I love the red shoes too - the outfit is like a walking ombre. This outfit, to me, is Annie Hall meets Nantucket Reds. It's more "city" than I have ever seen the Reds worn. I love how unexpected it is. I don't think that I, personally, could pull it off, but I love the way it looks on her. I like this outfit, though it may be a little ho hum for me. The white shirt is a little too expected. Still, it's cute. So it made the cut. I like the casualness of this outfit. It goes to show that you do not need a collared or pretty shirt to make Nantucket Reds work. OK, how adorable is this outfit? This seems to be similar to the shirt I want to pair with my skirt, though I'd roll up my sleeves. I love how she has added that pop of color in the belt. Super duper cute. I like this for work. It may be a bit matchy-matchy with all the white and red, but it is sweet nonetheless. Finally, back to the skirt! I adore the way she styled this outfit - from the navy top to the white belt to those perfect preppy shoes. 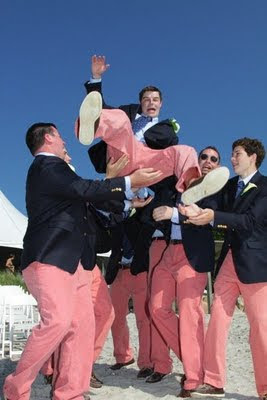 And I would be remiss if I posted about Nantucket Reds and didn't show how the men wear them. 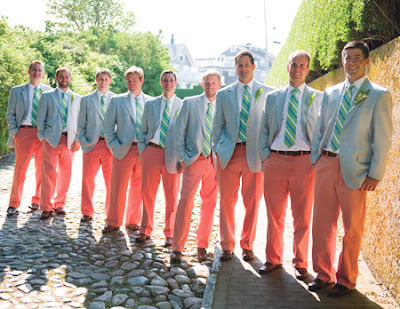 I hear they're a staple at Cape Cod weddings, which makes sense. I love the way this color looks on men. And there you go! My own round-up (much like my seersucker post from last Summer) on what made me swoon this Summer. What do you think? Is this your style?